Standard & Poors dropped a bomb Friday night by downgrading the US AAA rating to AA+ and by keeping a negative outlook on the rating. It is a historical precedent as the US rating has never downgraded since the rating agencies have been around. While media made much about it and very understandably so, for market participants, it shouldn’t have come as a big surprise as S&P had made its views very clear in past months of what needed to be done to avoid a rating downgrade and these conditions were not met by the agreement of Congress on the debt ceiling. It does however remind us all that the debt crisis is evolving and becoming ever more threatening for the industrial world. S&P justified the decision by pointing to both the political and the fiscal risk, the former even more important than the latter. S&P points to constitutional problems (debt ceiling) and the inability of Congress to take the decisions that are needed. S&P confidence that Congress might act on the fiscal situation has greatly diminished. The rating agency also said that the decisions taken during the debt ceiling debate are insufficient to address the long term sustainability issue of the US debt. The Treasury heavily contested the decision, which was according the Treasury based on some errors. The decision by S&P was not entirely unexpected, but might still have effects, maybe not so much, paradoxically, on the Treasury market, but on the economy causing further loss of confidence of consumers and businesses. Nonetheless, we expect US Treasuries to gain more ground, or at least remain well underpinned. Why? The rating downgrade risks affecting growth negatively via a confidence shock of consumers and businesses. Slower growth will also keep inflation in check. So observers might even start talking about deflation, a prospect that is still of minor importance, but that may change fast should a double dip effectively occur. However, US Treasuries might find another source of support, namely the Fed. Indeed, the Fed, as it did in the past, will feel the pressure to sooth investors’ fear for a recession or even a market crash and enact measures designed to assuage investor fears. That might mean lowering the rate on excess reserves, targeting US T-yields further on the curve (e.g. 2-year) as they did in the past or even open the door for Quantitative Easing III. One can be very critical towards more QE and question the positive effects, but in a first reaction it might be positive. Of course, Treasuries have done terrible well recently and historical lows (in yields) are not too far away. In this respect, we don’t feel Treasuries are very attractive. In a longer term perspective, the downgrade may start weighing on Treasuries, but probably only after the positive US-Treasury bond factors are losing value. On the currency markets, risk aversion may remain for now (as crisis continues) the driver. This means that upward pressures on Swiss Franc and Japanese yen will remain and eventual government actions may only slow the appreciation. The G-7 statement over the weekend contains the following passage on currencies: “We reaffirmed our shared interest in a strong and stable international financial system, and our support for market-determined exchange rates. Excess volatility and disorderly movements in exchange rates have adverse implications for economic and financial stability. We will consult closely in regard to actions in exchange markets and will cooperate as appropriate”. So, FX traders are warned that G-7 is watching developments in currency markets. However, we don’t think that coordinated interventions are likely at this juncture. The weak economic growth in the US combined with their big current account deficit means that a weaker US dollar is most likely wanted, at least by the Americans. Intervening against the fundamentals may only have short-lived effects and thus G-7 authorities will not easily be convinced to do coordinated interventions. 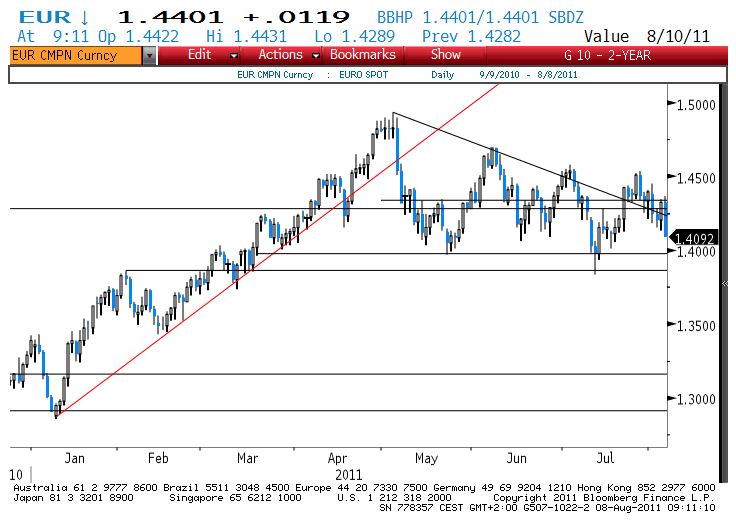 The EUR/USD was range-bound in the past months as both currencies have their own problems. The S&P downgrade of the US should be dollar positive, as long as it weighs on risky assets, even if intrinsically it is USD negative. However, this morning, the euro gains some ground and trades near 1.4380. We interpret it as the markets beding positive on the developments in the euro area, which would be in synch with the losses of the Bund. Of course, it is still early days and thus premature to draw many conclusions. At least, we should now the verdict of the US markets this afternoon. We are a bit skeptical about the upside potential of the pair and view levels around 1.46/1.47 as difficult to break through. If correct the current trading range would stay intact. In a longer term perspective, the dollar should weaken further, but mostly again Asian currencies. Regarding equities, they were heavily sold last week and are hugely oversold. So, while the US rating downgrade is certainly an equity negative, investors might put their hope on more Fed measures, maybe QE III, which was last year very positive for equities. However, we would be cautious. An eventual rebound might peter out. At least one would look to the technical picture. The S&P crashed last week through the key 1250 level, painting a bearish triple top formation on the charts. The last target of the configuration is about 1130. Only sustained trade above 1250 would suggest that the bear run is over.